The Regional Commission conducts bicycle & pedestrian planning activities through the Roanoke Valley Transportation Planning Organization (urban), Rural Transportation Planning program, and RIDE Solutions. For information about Greenways, see Greenways and Outdoor Recreation. The Regional Interactive Bicycle Map provides information on the region’s cycling infrastructure and related cycling resources to facilitate cycling as an efficient, safe, economical, healthy, and environmentally responsible means of transportation and recreation in the greater Roanoke area. Map information includes: on-street bicycle accommodations, routes (commuter, signed, alternate and themed), greenways and other shared use trails, Blue Ridge Parkway access, US Bicycle Route 76, Bikeway Plan for the RVTPO and Rural Bikeway Plan corridors, local bicycle shops, League of American Bicyclists designated Bicycle Friendly Businesses, and public transit routes. Note: Additional Interactive and printable maps – including greenway, trail, and transit maps – are available on the Regional Commission’s Maps page. The purpose of the Regional Bicycle & Pedestrian Advisory Committee, a subcommittee of the Roanoke Valley Transportation Planning Organization Transportation Technical Committee, is to facilitate regional collaboration with diverse stakeholders in planning bicycle and pedestrian infrastructure in the Roanoke Valley. 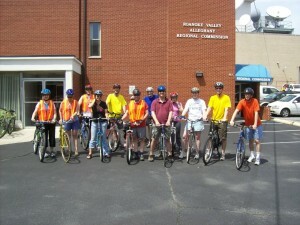 The Regional Bicycle & Pedestrian Advisory Committee, formerly known as the Bicycle Advisory Committee, was established in 2008 following a recommendation from a Bicycle Friendly Community workshop hosted by the League of American Bicyclist in Roanoke. RIDE Solutions provides alternative transportation options – ridesharing (carpooling and vanpooling), biking, public transit, walking, and guaranteed ride home services – to residents living within the greater New River and Roanoke Valleys and Region 2000 regions of southwestern Virginia. 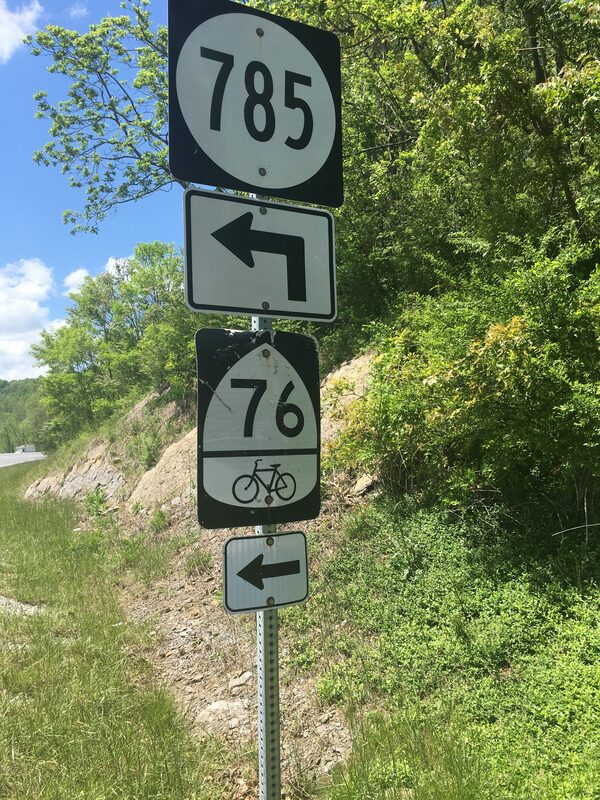 In 2017, the Regional Commission completed a study of USBR 76, a nationally designated bicycle route which extends through Botetourt and Roanoke Counties. In partnership with locality staff, the Regional Commission worked to craft non-binding recommendations for improvement of this corridor. Find out more about this document here. Since 2012 the Roanoke Valley Transportation Planning Organization (RVTPO), with assistance from the Regional Bicycle Advisory Committee, local governments, and volunteers has participated in the National Bicycle & Pedestrian Documentation (NBPD) Project a nationwide effort to provide a consistent model of bicycle and pedestrian data collection for use by planners, governments, and bicycle and pedestrian professionals. Each year staff and volunteers conduct manual counts of bicyclists and pedestrians at locations throughout the RVTPO study area during specified dates and times during the month of September. Volunteers are needed each year to assist with the NBPD Project. Contact the Regional Commission for additional information. 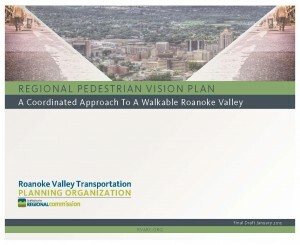 The Regional Pedestrian Vision Plan for the Roanoke Valley includes the cities of Roanoke and Salem, the Town of Vinton, and the portion of Bedford, Botetourt, Montgomery, and Roanoke Counties within the RVTPO 2040 study area. The Plan can be read online or downloaded. An interactive map of the pedestrian infrastructure recommendations is also available. The Bikeway Plan for the RVAMPO – 2012 Update, approved by the RVAMPO Executive Board on March 22, 2012 is an update of the Bikeway Plan for the Roanoke Valley Area MPO – 2005 Update. 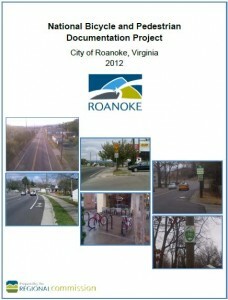 The Bikeway Plan- 2012 Update covers the cities of Roanoke and Salem, the Town of Vinton, and the portion of Botetourt County and Roanoke County within the RVAMPO 2035 MPO study area. Download the entire Bikeway Plan for the RVAMPO – 2012 Update (large file 22 MB). Printed copies and CD/DVD copies of the plan are available at the Regional Commission. All mapping associated with the Bikeway Plan is available on the RVARC Interactive Bicycle Map.